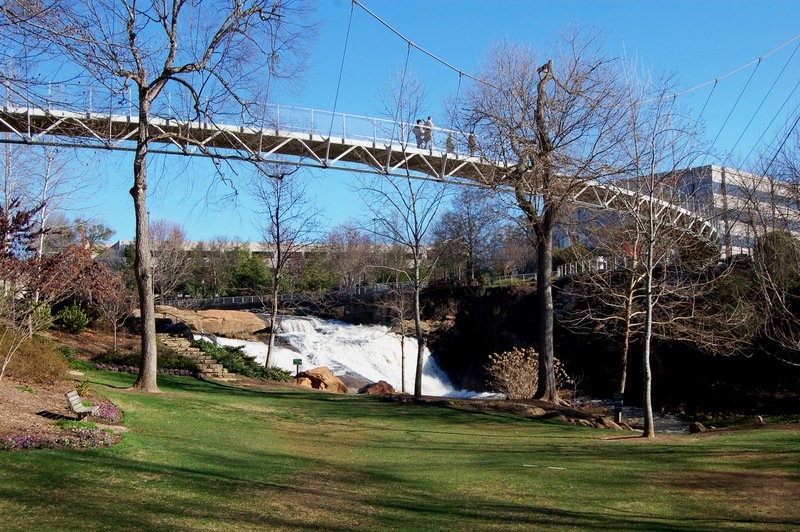 Inspired by A Tidewater Gardener to capture glimpses of a world beyond my own backyard, I chose Greenville’s Falls Park and Liberty Bridge over the Reedy River for my early morning Winter Walk-Off 2013. 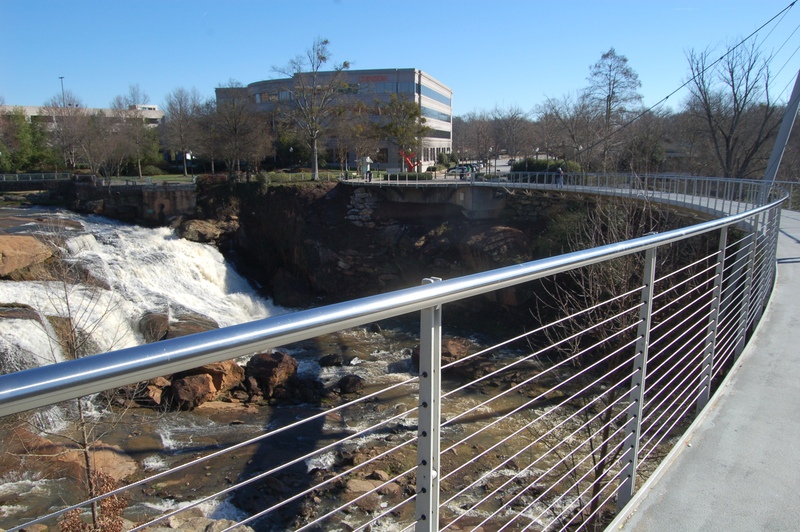 The Reedy River Falls in downtown Greenville are 28-feet tall. 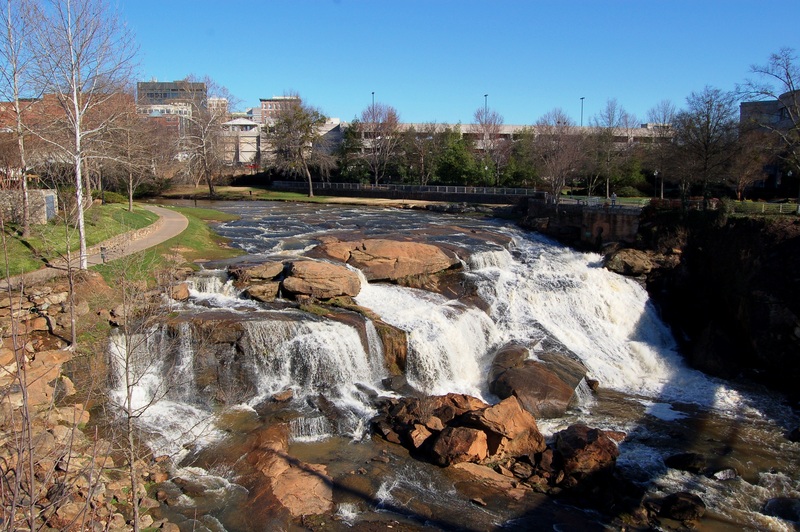 If Greenville is the hub of the Upstate, then Falls Park is the hub of Greenville. The park features breathtaking waterfalls, scenic overlooks, landscaped garden areas, nature trails, a pond, and a spectacular land bridge. Falls Cottage (1838) is located within the park along with a historic grist mill. Plaques provide details related to local history and native plant species. 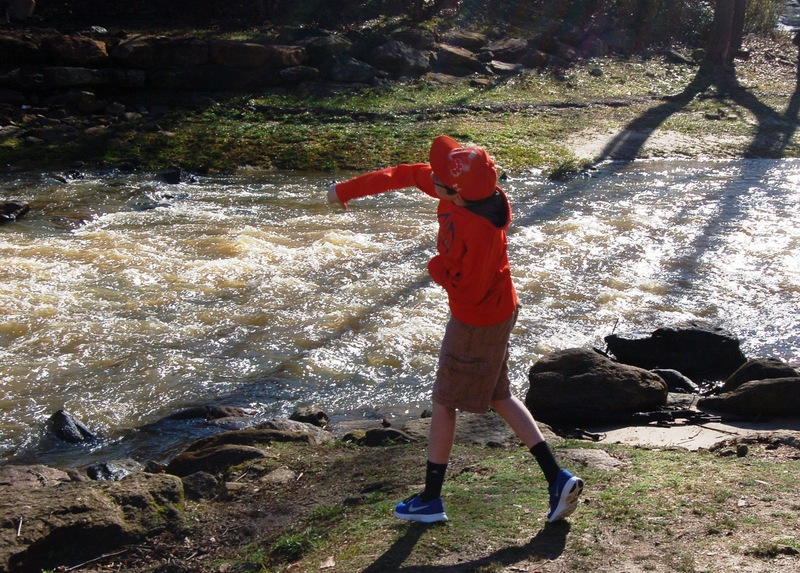 Reedy River Falls is where Greenville’s first European settler, Richard Pearis, established his trading post in 1768. Pearis later built grist and saw mills at this same location and it continued as the epicenter of industry in Greenville until the 1920s. 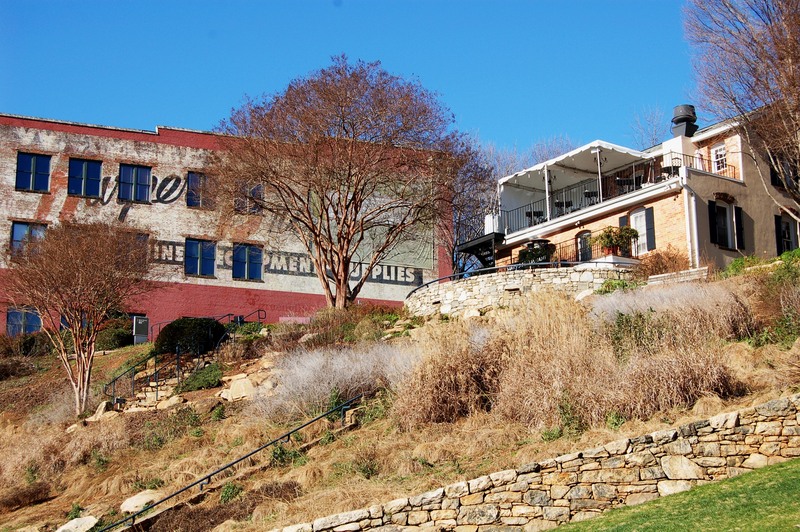 Although you wouldn’t know it now, Greenville was once touted as The Textile Center of the South, with three mills operating on the Reedy River. 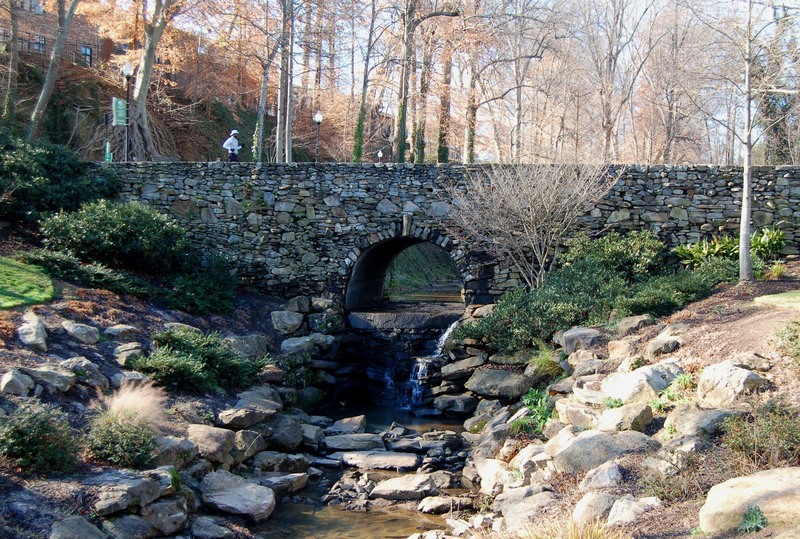 In 1967 Carolina Foothills Garden Club, with the support of Furman University, the City of Greenville, and the Planning Commission, reclaimed 26 acres for the current park. The Club remains a driving force in the park’s development, restoration, and preservation. Liberty Bridge was designed by bridge architect Miquel Rosales of Boston, engineered by Schlaich Bergermann of Stuttgart, Germany, and constructed in 12 months by Taylor and Murphy Construction Co. of Asheville, N.C. The bridge’s concrete reinforced deck (345 feet long, 12 feet wide and 8 inches thick) is supported by a single suspension cable. The deck’s distinctive curve has a radius of 214 feet and it is cantilevered toward the waterfall from supporting cables on the outside. The bridge deck also inclines 12 feet or 3 percent from east to west over the river. 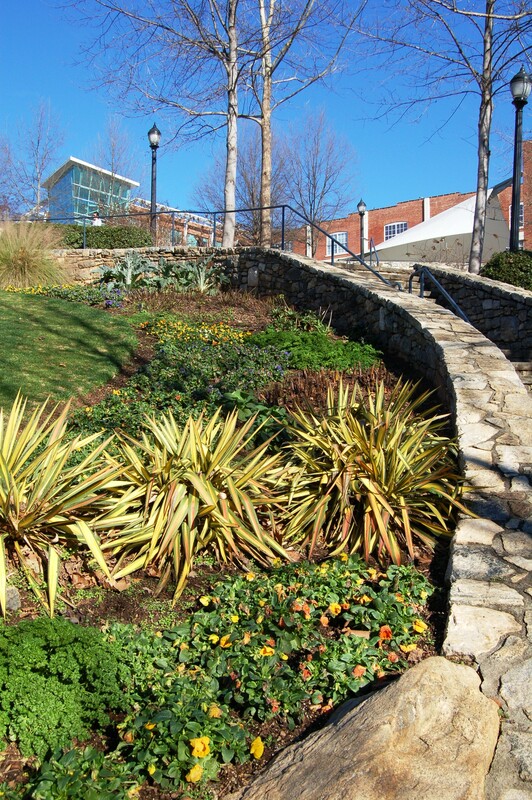 Today, Falls Park is the location for many public events, from Shakespeare in the Park to Artisphere, and is regarded as a feature attraction of the Upstate. 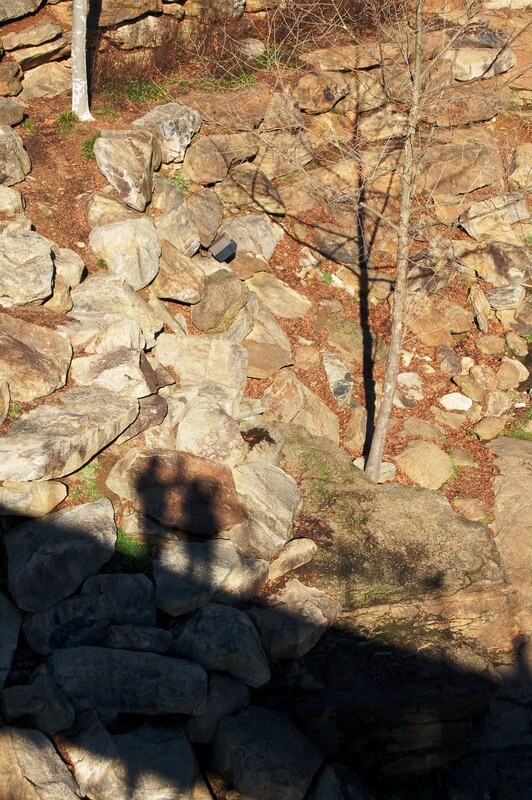 Details for this post were taken from Greenville’s website FALLS PARK. 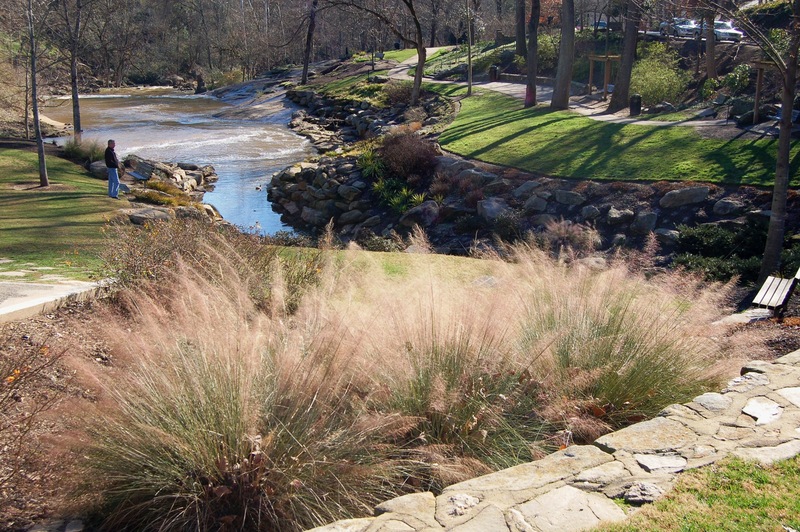 This entry was posted in Gardening, Nature and tagged Carolina Foothills Garden Club, Falls Cottage, Falls Park, Greenville South Carolina, grist mill, Liberty Bridge, Muhlenbergia capillaris, Muhly grass, Reedy River, Reedy River Falls, Richard Pearis on February 22, 2013 by Marian St.Clair. Spartanburg is often referred to as the Hub City because of serving as a railroad hub in a mainly textile industry. Strange to hear of Greenville also being referred to as a hub as well. Thanks for playing along with my walk-off. You were the first this year. I have only been to Greenville once, and that was ages ago, long before that way-cool bridge was there. I lived just outside of Charleston for 3 years and while I was there I took a road trip to see the Upcountry. I remember how different it felt from the coast. Les–I grew up in Virginia not too far from you but have lived in SC since 1983. Sometimes I still miss “home” but the longer I’m in SC the more I appreciate what a wonderful state it is. Thanks for thinking of the walk-off, it was fun to explore a bit further afield. Jordi–please come again. It was fun to look at your blog and use the photos as a clue to your message while puzzling over the text! Jordi–great feature! Your region is beautiful; hope I can visit someday! Thanks for sharing your walk-off. That bridge is amazing, like a sculpture. Thanks, Carolyn. Sometimes the bridge is sculpture in motion, as it moves a bit when lots of people are on it, or someone jogs across. Your back yard is our back yard, too! We came to the Greenville area 35 years ago and have watched a lovely city become even more beautiful. I love our park and Main Street. Tee–Tim and I can’t imagine living anywhere else! So very glad you did the Falls Park. What great foresight of Greenville and community to build this very cool park in the middle of downtown. I need to explore Greenville so much more. Janet–I agree! When Tim and I moved to Greenville in 2000 there was a road over the falls instead of the landbridge. Taking out the road completely changed the park. It’s fabulous now and always full of people! What a lovely walk. You are so lucky to have such a beautiful attraction in your community. The photos were very enjoyable. Thanks, Charlie! Greenville is great fun, come see us!